Right now you can get this LEGO DUPLO Minnie's Birthday Party 10873 Building Blocks for ONLY $15.99 (Retail $19.99)! Little Disney fans will love to help Minnie Mouse celebrate in style with LEGO DUPLO Minnie birthday party! play with them as they drive Minnie in her cute pink car to the party venue, where Figaro the cat is waiting to get the party started. This LEGO DUPLO set is perfect for endless role-play with a birthday celebration theme, and comes with a giant buildable birthday cake plus 2 bricks decorated as presents. 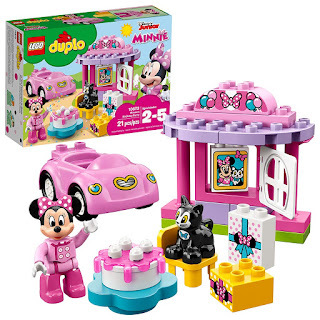 Includes a LEGO DUPLO figure: Minnie Mouse, plus a cat figure.